This is a cool statistic of the general population. 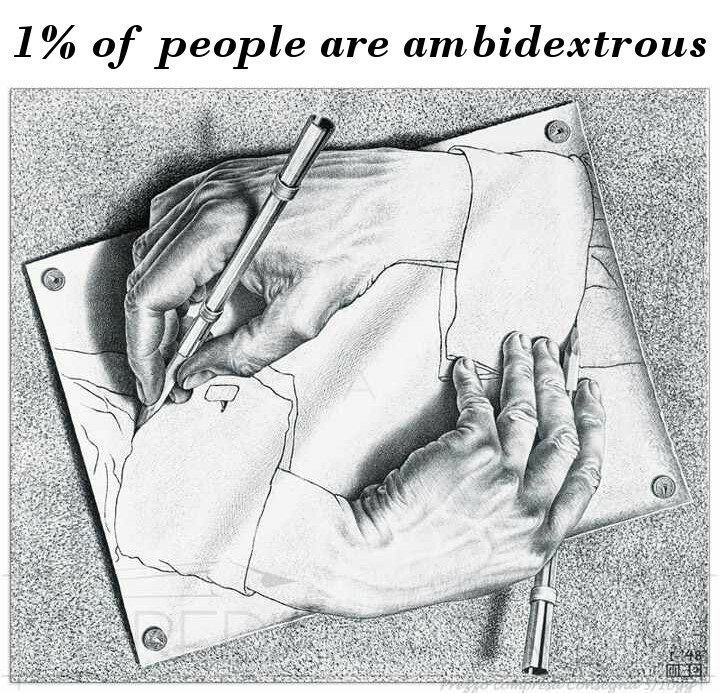 About 1% of people are ambidextrous, or in otherwords don't have a dominant hand. In contrast, about 90% of the population are right handed and about 10% are left handed. There is much debate in the scientific community as to why there are many more right handed people, but one thing is for certain is that with practice and determination you could train yourself to improve either hands performance. In fact if you were to use your less dominant hand often enough, it can become the dominant one and your brain will think so as well. From personal experience, training to become ambidextrous in many things, such as writing or kicking a soccer ball, has helped me to always think in more detail in many other aspects of my life. So try using your less dominant hand more often as it is quite the brain exercise. In fact, doctors often recommend this strategy to patients with Alzheimers to help slow down the process of memory loss, since your brain has to work harder when initially using your less dominant hand. Think of your brain the same way as you do your muscles, the more you work it out the stronger it gets!